The BSE Sensex rose 0.4 percent in choppy new year trading on Monday as investors cheered a government decision to allow foreigners to directly buy stocks, but the market remained unconvinced about risk appetite amid worries about the global economy. The 2012-13 budget will be delayed this year due to the Assembly elections in five states, including Punjab, and is likely to be presented in the second week of March, with the most likely dates being March 10 or 11. The country's general budget is traditionally presented on the last day of February every year. Concerned over the country’s declining growth, Reserve Bank of India governor D Subbarao has indicated the central bank could reverse the tight monetary stance adopted by it since March 2010 to tame spiralling inflation. An end to the confrontation between the department of telecom and the private telecom operators over the 3G roaming pacts entered into by the latter does not seem to in sight with the former alleging that service providers had “not come with clean hands” and that they have “suppressed material documents”. Manufacturing activity surged to a six-month high in December thanks to a spike in factory output and new orders from domestic and international firms, a survey of purchasing managers showed on Monday. The month of December was a year of joy and celebrations for some auto companies, while for others it was a period of mixed reactions. This is because even though the overall results were not so positive, some of the car brands registered good sales. After an average loss of over US $1 million in every ten seconds of trade in stocks last year, market pundits seem to be playing it safe and are predicting Sensex levels ranging from as low as 8,000 to as high as 28,500 points in 2012. Starting the new year on an upbeat note, billionaire Mukesh Ambani-led Reliance Industries on Monday regained its position of the country's most-valued company and pushed Tata group firm TCS to the second slot. State-owned Oil and Natural Gas Corp plans to invest $2.894 billion (about Rs 15,340 crore) in developing its ultra-deep sea UD-1 gas discovery in the Krishna Godavari basin by 2016-17. The Sensex, which had lost over 515 points in the previous four sessions, settled with a moderate rise of 63 points or 0.41% at 15,517.92, as heavyweights Reliance Industries and Infosys closed with gains. While RIL was up 2.03%, Infosys gained 1.44%. The two carry about 20% weight in the Index. Coal India and Tata Motors climbed on positive newsflow, but Bajaj Auto tumbled 7.3% on worries over its sales growth outlook, while iron ore exporters slid after a sharp increase in export duty. "Most issues still relate to the fact that investors are not returning to the market for long-term investment," said Deven Choksey, chief executive at K R Choksey Shares & Securities. "I don't see the market heading down much further, but till results season starts, there is likely to be uncertainty." The 30-share index closed up 0.41% at 15,517.92 points. It had fallen as much as 0.6% earlier. 19 of its components closed higher. 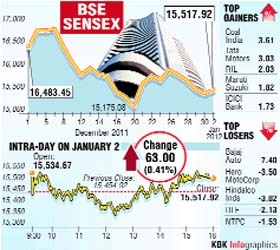 The Sensex had been among the worst performing markets in the world in 2011, falling 24.6%. Counting for the state elections in Punjab, Uttar Pradesh, Uttarakhand, Goa and Manipur will be completed on March 4, and a week after that the budget is likely to be presented. Once Parliament's budget session convenes, two important economic statements in the form of the Economic Survey and the railway budget will have to precede the main budget. Although the dates have not been finalised, it could stretch to the second week of March. The business advisory committee of Parliament will be taking a decision on the dates for the budget session. Finance Minister Pranab Mukherjee clarified on Monday the budget would be presented after the completion of elections in five states, but the government has not yet decided on the final date. "We've not yet decided the time (for the budget), but naturally it will be after the elections," he said while replying to a query on the likely date for presenting the budget. The announcement of the Assembly election schedule in five states between January 30 and March 3 is leading to the rescheduling of the budget for 2012-13 this year. Work in the Finance Ministry on the budget has commenced since December and with the schedule of elections being announced, officials will make the necessary adjustments which may mean that the proposals are finalised but are sent for printing later than usual. Mukherjee will hold brainstorming sessions with various stakeholders during his annual pre-budget meetings beginning January 11. The first meeting would be held with farmers, followed by a series of interactions with sectoral experts, representatives, industry captains and economists over the next 10 days to get their feedback and inputs for incorporating them in the FY2012-13 budget. "From here on we could expect reversal of monetary tightening," Subbarao told the BBC in an interview. The Reserve Bank chief, however, added it was "difficult to say when that will take place and in what shape it will roll out". The central bank is scheduled to announce the monetary policy review on January 24. The Reserve Bank has hiked key interest rate thirteen times since March 2010 in its bid to check rising inflation, but it took a pause in its December monetary policy. Moderation in inflation witnessed in November-December has raised the hopes the RBI may start reducing key interest rate in its forthcoming credit policies. Headline inflation dropped to 9.1 per cent in November from 9.73 per cent in the previous month, while as per the data food inflation has declined to 0.42 per cent. Subbarao said although inflation still remained a risk, the central bank was aware that it needed to boost growth amid an uncertain global economic environment. "We have always been mindful of growth concerns, contrary to popular perceptions," Subbarao said, adding "in fact, in our December statement we said that growth is a serious concern. So I think the balance between growth and inflation will shift in 2012". While the high interest rate has helped in moderating inflation, the high cost of credit has taken its toll on the economic growth. The allegation came in an affidavit before the telecom dispute tribunal TDSAT, where DoT had requested the latter to dismiss the telecom operators’ petition challenging the government directive to stop 3G roaming immediately. As has been its stand from the beginning, the DoT, in the affidavit has also said that the 3G roaming pact by operators were “in violation of various terms and conditions of cellular mobile telecom service licenses and various terms and conditions of the notice inviting applications (NIA) dated February 25, 2010 for the 3G/BWA auction”. DoT has asked the private operators, who include the top service providers of the country, to stop offering the 3G roaming to their subscribers in the areas where they had failed to win 3G spectrum in the auction held in 2010. The telecom operators — Bharti, Vodafone, Idea, Aircel and Tata — had entered into agreement with each other to offer 3G services in the name of inter-circle roaming, thereby avoiding any spectrum usage charge or license fee to the government. DoT had on Dec 23, 2011, issued notices to telcos saying their 3G roaming pacts were illegal and should be stopped immediately within 24 hours. Following the order the operators, who have sought Prime Minister Manmohan Singh’s intervention and have also threatened to return the 3G spectrum if they were forced to stop offering the service, challenged DoT’s decision before TDSAT on the same day. Passing an interim order on an urgent petition moved by operators against the DoT directive, TDSAT on December 24, 2011 restrained the government from taking any coercive action against them. DoT also said that operators’ petition was also not maintainable as relief sought for would amount to altering the terms and conditions of the CMTS/UAS license agreement and the NIA for 3G/BWA Auction. “It may be noted there is no challenge to the terms and conditions of the CMTS/UAS license. However, by way of present petition the petitioners are mischievously seeking such reliefs which are contrary to the terms and conditions of the CMTS/UAS license and the NIA for 3G/BWA Auction,” DoT said. The batch of petitions will come up for hearing on Tuesday before the tribunal. The HSBC Markit India Manufacturing PMI jumped to 54.2 from 51.0 in November, its biggest monthly rise since April 2009. The index has stayed above the 50 mark that separates growth from contraction for 33 months now. The PMI came closest to suggesting a contraction in September when it dipped to 50.4. Manufacturing in Asia's third largest economy is expanding, just as factory activity in developed economies across the world is contracting. Data released in China on Friday, shows the sector likely shrank in December, after remaining mostly below 50 since July..
"Activity in the manufacturing sector rebounded in December led by higher demand from both domestic and foreign clients, suggesting that the momentum in the sector is not quite as weak as official and more dated IP (industrial production) data would suggest," said Leif Eskesen, economist at HSBC. Official data released last month showed industrial output plunged 5.1% in the year to October, its steepest fall since March 2009, raising fears the economy might be heading for a hard landing. For instance, Maruti Suzuki reported a decline in figures, but its models like DZire and SX4 fared well in the market. Maruti Suzuki India's sales declined for the seventh consecutive month with the firm on Monday reporting a 7.1% fall in December last year to 92,161 units. The company had sold 99,225 units in the same month in the previous year, the company said. Maruti Suzuki's exports, however, jumped by 50.5% in December, 2011, to 14,686 units from 9,756 units in the year-ago period, the company added. 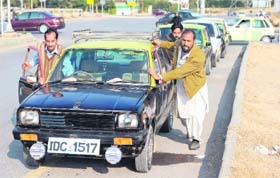 Total passenger vehicles car sales declined by 8.4 per cent to 69,329 units last month from 75,652 units in the same month of 2010, it added. Ford India posted a 39% jump in sales for December, 2011, to 5,979 units. The company sold 4,301 units in the same month of 2010, Ford India said in a statement. In the whole of 2011 the company sold 96,270 units in the domestic market, up 15% compared to the previous year. General Motors India reported a 6.74% rise in sales for December 2011 at 9,039 units. The company had sold 8,468 units in the same month of the previous year. Luxury car maker Mercedes-Benz India reported a 2.82% rise in its sales for December 2011 at 730 units. For the entire 2011 the company's sales increased by 27.69 per cent to 7,430 units from 5,819 units in 2010. Nissan Motor India reported a jump of 44.57 per cent in its total sales for December, 2011 at 1,596 units. In the same month the previous year, the company had sold a total of 1,104 units, it said in a statement. Two-wheeler manufacturer Honda Motorcycle & Scooter India reported a 36.15% growth in sales in December 2011 at 191,584 units over the year-ago period. The country's second largest two-wheeler maker Bajaj Auto reported a 8.22% rise in motorcycle sales in December 2011 at 263,699 units — the highest monthly sales of the company. Going by these wide projections, the market valuations could either plunge to a low of about half the current levels, or might double in the new year. Tata Consultancy Services (TCS) had dethroned RIL from the pole position in market-valuation charts on Dec 30, the last trading session of 2011, but its leadership position proved to be short-lived and it slipped to the second position in today's trading session — the first of 2012. ONGC believes the UD-1 gas discovery in the southern part of its Block KG-DWN-98/2 can produce for 14-15 years with peak of about 20 million cubic meters per day (mmcmd) lasting for five years, official sources said.